Before I moved my mother into Lakeland Nursing home early in 2008, she lived at Ridgeland Point Assisted Living for a couple of years. 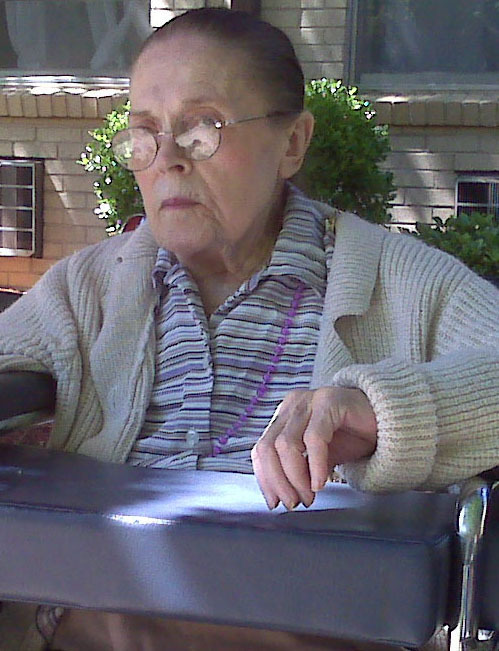 I wrote numerous blog posts about those days, and also about her time in the nursing home. One of those posts was published as an essay in the Southern Women’s Review in 2010: “The Glasses.” (You have to scroll down to page 36 to read the essay.) Or you can read it on an old blog post from 2008, here. I was thinking about that story this morning and decided to write a follow up. It started last Thursday when I visited mom in the nursing home. I’ve been mostly pleased with her care there these past 6-7 years, but last week several things concerned me. When I arrived at Lakeland the halls were fairly empty. 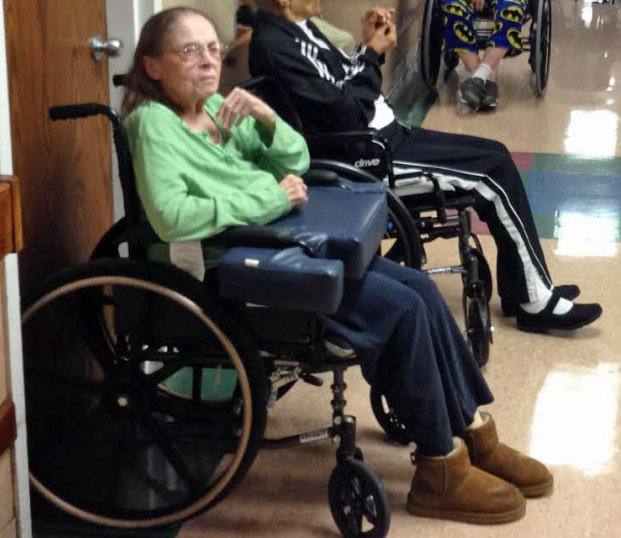 Mom is often “parked” in her wheelchair—along with many other residents—right by the nurses’ station on her wing. From her perch she can watch the comings and goings, and often smiles at everyone. The nurses and aides will smile back and say “Hi, Miss Effie.” She seems content in her ever-shrinking world. But last Thursday most of the residents were in the dining hall, listening to a woman who was playing the guitar and singing. She had a good voice, and I know my mother would love the live music, I was happy to see the music being provided. But I scanned the room and was disappointed to find that Mom wasn’t in there. I stopped by the nurses’ station and asked where she was. “She’s in her room,” answered a nurse I hadn’t seen before. I stepped into Mom’s room and found her sitting by the window in her wheelchair. She smiled when she saw me, but immediately said, “I’m hot.” The sun was shining directly on her face. She had a heavy sweater around her shoulders and neck, and the wheels were locked on her chair, so she couldn’t scoot away from the sun. Trapped. While everyone else was in the dining hall listening to music. After removing her sweater and unlocking her wheels and moving her into the shade, we visited for a few minutes. I had brought her some new clothes, so she watched as I took them from the Stein Mart bag and cut the tags off. First a colorful blouse and three camisoles. Next some soft socks and a new nightgown. Finally some new slippers. She touched all the fabrics and exclaimed with delight over the textures and colors. After I put them in her closet, I noticed that she wasn’t wearing her glasses. I headed down the hall and found the nurse—the one I hadn’t met before—and asked her about the glasses. “I’ll call one of the aides.” She didn’t bother to look in the room herself, or to apologize. She started to walk away when I stopped her. “Wait. I have a question. Why isn’t Mom in the dining room listening to the music with the other residents?” An aide had walked up and joined us at this point. “We take her to activities all the time.” Her tone was defensive. I went back into Mom’s room and continued to search for her glasses. No one came to help me, and no social worker showed up. Finally I needed to leave to drive back to Memphis. When I got home I called and asked for the social worker. The director of social services wasn’t there but they put me through to a social worker. I told her my concerns, and she said she would be sure Mom was taken to any music events in the future. Then I asked about her glasses. “I’ve got some here in my drawer that have been turned in,” she said. She texted me pictures of two pair. They weren’t Mom’s glasses. I decided to send her a picture of Mom wearing her glasses, to help her recognize them. That was last Friday. I was out of town Saturday and Sunday but I called this morning to see if they had found her glasses. I got her voice mail. So I asked for the nurses’ station. A nurse answered and I told her my concerns. She put me on hold to go and see if Mom had her glasses on this morning. No. And she couldn’t find them in her room. She apologized and said she would search the rooms of others who wear glasses. Maybe an aid put them in the wrong room after taking the residents to the shower or something. I told her about my concerns about the music and Mom being “trapped” in her room and all that. She was sweet and apologetic. I’m hoping this was an isolated incident. It’s so hard when someone is completely helpless and dependent upon the kindness of others for their care. An 86-year-old woman with Alzheimer’s and bad eye sight and no “voice” to speak up for herself. I’m trying to be her advocate, and hopefully I found help with this sweet nurse this morning. She’s going to call me this afternoon and let me know about the glasses. And she’s going to talk with others about being sure Mom is taken to musical events in the future. I’m much more at peace after talking with her. Just praying they find her glasses…. A happy update: at 11:15 the nurse called me back to say they found her glasses! She has them on and is “happily wheeling herself up and down the hall again.” I am so thankful. I hope they find her glasses also. I wonder if the nurse you hadn’t seen before was only filling in or was there as ‘relief’. I often think that those who aren’t there all the time really don’t want to be there and this reflects in their work and attitude.